Think video isn't for B2B? Not using video because you think it's expensive? If youíre not, you may be missing out on your share of YouTube's massive traffic. With over 800 million unique users visiting monthly, it's likely your customers and prospects are watching videos on mega video site and not just for entertainment. 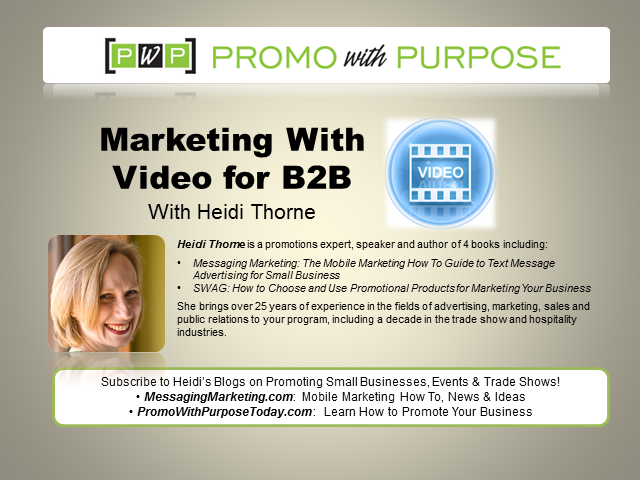 Your presenter, Heidi Thorne of Thorne Communications LLC, has been able to leverage her YouTube channel to create new selling and public relations opportunities for her company which primarily serves B2B clients. Her presentation will offer practical tips on using video for business.